Oh..He was aware.... He's just determined to do it his way, or else. There is also a rumor floating around that allegedly came directly from him, that the NRA is searching for a new venue for the Nationals, and WV is a possibility.. 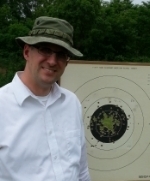 I am less opposed to a venue change, than I am to removing turning targets from the game.. If the move it, I wish they would move it closer to Oregon by a thousand or two miles. If it moves to WV, I'll probably never make it. Any editor should be careful of their reputation when publishing material that has questionable facts. Let them know you read it and disagree with the comments! I believe that the information quoted by Mr. Dennis Willing should be reviewed for accuracy or source. A great number of competitors, and I mean many more than 5%, have expressed considerable difference of opinion about the the use of electronic targets for Conventional Pistol at Camp Perry (both in person, on the electronic listserve, and at the match). A significant number of competitors at the meeting were not in agreement with the change at this time. Can you please provide the source of the survey information quoted by Mr. Willing. I hope it is not from the sales person at the match? I kept an open mind until I actually tried out the system. I was not impressed or pleased with the result. The technology demonstrated doe not translate well for Conventional Pistol shooting. It will not work unless we change the current rules. Therefore, I am not in agreement with a change that will have technology only available for a select few, will significantly change the ability of local matches to provide a competitive offerings to the shooters, and would require rule changes (non NRA approved targets, non turning targets, scoring rules for excess shots, crossfires, etc. ) for the benefit of a single match. If the NRA proceeds with this change, there will be no real benefit for local matches to continue to participate in the NRA Approved or Registered match program, simply because the the majority of the competitors will not have the ability to train on the same equipment that would used for the National Matches. The NRA will simply be creating another reason for clubs to hold "outlaw" matches with paper targets and NRA rules, but not getting Approved status and sending in scores. In reality, a classification on turning targets will not mean a thing when a competitor goes to the nationals and is shooting against someone that can train all the time on electronic targets. If we want to improve the Nationals; get better housing, fix the target turners and have matches almost anyone can train for! If you want to increase participation at the National Match, you simply need to help local match directors put on more matches, not make it different just to make it easier for those running that match. Please remember above all else, the National Match shooters come from the local matches, not the other way around. Be sure the read the comments to Tony's latest blog. Perhaps next year, the Little League World Series can be played using the rules of Cricket. It's just a few changes at one event. What could possibly go wrong? from the way they are talking, it will happen. DavidR wrote: from the way they are talking, it will happen. 1st rule of change management when change is being forced on you - get involved and steer it into the direction that will give you most of what you want. David, there has seemed to be very little doubt for quite some time. The article strikes me as a very long justification for a decision made long ago. The idea of a loud horn does not appeal to me. We use a signal like this in one of the matches I shoot regularly. The older shooters don't seem to be able to hear audible start commands of any variety. Anything loud enough for the virtually deaf will be incredibly startling for those of us that still hear well. I love electronic targets in smallbore, and I would love them for high power. In these events, the targets don't turn. In high power, the targets do move into and out of the pits, but rapid fire is anything but rapid in rifle. The author says that we wouldn't replace our fridges with those from the 1950's. I wouldn't mind replacing a few of my 1911s with some from the 1950s. What is the lifespan of the average electronic system (hint: it is way less than 60 years)? If the NRA has lacked the funds to maintain the current systems, as evidenced by admitted years of neglect. How do they hope to keep up with the the life cycles of systems that are measured in years rather than decades? I recently read an article concerning the fact that a number of states are switching back to paper ballots (from electronic ballots) because they could not afford the maintenance and upgrade cycles of the electronic machines. I know personally that I have experienced control systems for new construction that were out of date by the time the building was opened. The only upgrade was complete replacement. I have shot the e-targets for air rifle and I liked them very much. But I don't think that the design of the air rifle matches needed to change to accommodate e targets. Bullseye has remained essentially unchanged since 1941 but Denny asserts that change is what keeps bullseye going. I disagree. It's the pursuit of Herschel's record that keeps us reaching for the next 10 and the next X. The rhetoric about betamax, TWA, and Compaq are insulting as are the inferences that replacing the 1950s vintage turning target system with another modern turning target system is akin to replacing your car with a 1950s one is insulting. If you replace a 1952 Chevy with a 2014 Chevy, both still have a steering wheel, 4 tires, a heater, a gas pedal and a brake pedal. Replacing a 1952 turning target with a 2014 non-turning target is like replacing the 1952 Chevy with a 2014 Chevy that has a junk motor--you can play with the fancy new touch-screen trip computer, but it isn't going to maintain the continuity with the generations of bullseye shooters who came before, and when somebody finally breaks Herschel's record, that shooter will have a great achievement, but it wont quite be the same achievement. A different hurdle will have been crossed. Denny alludes to cost savings related to replacing the system with the electronic targets, then says replacing the old system has more to do with the age of the old stuff. It's either about cost or it isn't. I wish they would lay the cost out for all to see. Denny says his only options are to replace the system with 50s technology or non-turning electronic scoring targets. I reject this. There are many modern PLCs and other computer operated upgrades that can be used to maintain the sport that we all enjoy. Denny says that a handful of ranges are installing electronic targets, meanwhile we need to recruit new shooters who supposedly lack the attention span to use anything but electronic targets. He says that the grass roots growth of the sport are what is needed to get bullseye to grow. If electronic targets for bullseye ARE the future of this sport, and it's also true that grassroots interest is needed for bullseye to survive, then what needs to happen FIRST is the rules for clubs to compete with these products need to be implemented, and the "best practices" for conducting matches with these electronic targets needs to be known. This sport needs to make sure that using electronic targets works well at the CLUB level FIRST. If it works poorly, it will only split the sport between the shooters who prefer the non-turning electronics over the turning paper targets. The split is assured as there are many more clubs that have the turning paper targets than there are with non-turning electronic ones. The tactic that Denny is using here is common in politics. It's not "cramming something down our throats" but it's close. It's presenting only half of the facts and insinuating that the people who don't agree with the subset of facts are the sort of backwards-thinking people who would buy a 1950 refrigerator or a Compaq computer. I agree with Cecil 110% regarding the 5% ...I have decried this proposal from the very beginning. I have been in this game quite a while, and know a fair number of the big players.. NOT ONE...!!!! of the top ten that I have talked to is in favor of this .. I am totally disgusted with the manner in which the NRA/and Willing has jammed this down our throats. Reminds me of the ACA.. Probably not very good, but here are my points (again). I recently read with great regret the one sided and somewhat skewed article, "The Future of Conventional Pistol. I would say that this might be the Death of conventional pistol competition at the national level by creating a competition that cannot be duplicated at the local level today for a reasonable amount of money. The big underlying common denominator for Conventional Pistol shooting is that it did not matter if you were at the local range or the national matches; the distance, timing and operation of the match (including the targets and scoring) were the same! Outside of the weather, the newest Marksman could compare his score with the National Match winner and feel some sense of equal playing field. The author of this article seems to be predisposed to removing this intrinsic aspect from the national matches under the guise of technology, money and promise of increased participation. The author continually decries the state of the facilities and technology of the Conventional Pistol facilities at Camp Perry. Then this becomes a platform for mandating the change to a different "technology" which will magically improve the attendance and participation in Conventional Pistol matches and the national matches. As written, article seems to mandate a change without consideration for all the comment provided at the competitors meeting, by the actual shooters, and by many others on the bullseye list and forums. While the chosen change and technology seems predetermined from the article, the division of opinions by shooters is no where near that clear. Therefore this article appears to be a platform for "telling" rather than "asking" or "evaluating". Please pardon my opinion, but it sounds like the NRA and the individual(s) in charge of the matches are to blame for the state of the facilities. I assume is was in their job descriptions to maintain and provide national match facilities? Funny thing though, the local clubs seem to have no trouble at all building and installed turning targets with better quality and technology than that available at Camp Perry. New technology is not needed when better technology that will not change the nature of the contest (turning targets) is readily and easily available. To profess to do so flies in the face of the experience of a number of local ranges and clubs that provide turning targets for thousands less than the proposed cost of the new technology, with none of the game changing mandates. For some members, this may cause some question on the actual reasons for trying to promote a specific choice at this time. Additional, when reading the article, those of us that have actually run matches, developed Conventional Pistol Programs and increased attendance at matches are amazed at the revelation that new technology is needed (actually the article seems to make that "required") to save Conventional (bullseye) Pistol shooting! Here we are promoting matches, running matches, putting on clinics and introductory matches, begging military teams and HM shooters to attend our matches to coach and develop shooters, getting gunsmiths to attend to support matches, begging vendors for SWAG, etc., etc. And all we needed to do was just get new technology! Why didn't we think of that. Funny thing is that those that actually do the things mentioned above have full lines and lots of shooters at the local and state level matches! You can find a match within almost reasonable driving time almost every weekend in our state. I'll tell you a secret if you really want to know. The way to get more shooters is to have more matches. And that requires individuals with the drive and desire to put on, manage and run those programs. And shooters want matches that provide them with the same rules, operation and contest that they will seen when they go to sectionals, regional and the the national matches. Therefore, as I have stated before to you, I do not endorse the change at the national match level away from turning targets until we can economically provide the opportunity for electronic targets for more than half of the existing conventional pistol matches and ranges. If the NRA wants to change the nature of the game, then please start and finance that change at the local level first. That's where your support, developing shooters and dollars come from. Providing a National Match format that cannot be reproduced on the local level does nothing to promote or grow the sport. Please remember that sometimes people leave the sport and may come back, but when the sport leaves the people that supported it, they probably will not go with it. Excellent letter Cecil. Much as I would have written it. I wonder if the reason there have been no complaints from rifle shooters, is that electronic targets for rifle require no pit duty, but don't require any other changes to the format of the match? I wish that Dennis had spent his time in Europe looking at the purchase agreements, financing, and maintenance contracts of the clubs using the electronic targets, rather than admiring the shiny toys. You always have to ask, whenever you look at large expensive things, in semi socialist European countries, how much of the cost was ultimately shouldered by the tax payers either directly or in the form of subsidies to the companies producing the electronic target systems. I would be interested to know what kind of hardware/ software upgrades are included in the maintenance contract, and if they have accounted for set up, take down and storage for every year they use them at Perry? I also noticed there was no reference in Denny's article to international shooting in the US. where the move to electronic targets has done nothing to increase participation in pistol. He also glossed over the fact that 2014 attendance was up at Perry from those 2013 numbers. I guess it didn't fit the narrative. Does anyone remember when this issue was first raised, the question was originally, how much more in entry fees would people be willing to pay in order to shoot on electronic targets? I guess somehow, money is no longer an issue. If there is something besides the military pulling their support from conventional pistol to blame for reduced numbers, a much more likely suspect is the restrictive handgun laws in many of the most populous states in the US, and the increased popularity of action pistol. How do you recruit junior shooters when they cant even own a pistol legally until they are 21? There has been an ideological war on handgun ownership in this country since the 1960's. I am amazed that we can attract the numbers that we do. If the simple wooden fence can't be maintained due to budget and neglect how can they expect to maintain state of the art systems? Currently, a P100 or NTI can take 12 hours to run for rifle. Electronic targets would be a Godsend for rifle. Pit service can be really inconsistent from point to point. Electronic targets could allow a rifle shooter to better utilize a single condition for firing his/her shots. There is a time and an effort win for rifle shooters. For pistol, the very nature of the matches have to change if we move to electronic targets. If we must move, I hope one day we can have the P100 and NTI for pistol and rifle done such that shooters could do both in one trip. Who owns the gear at Perry? When I have been, there seems to be a bit of an adversarial relationship between CMP and NRA in terms of scheduling and the equipment. According to the TV schedule, looks like this weeks Shooting USA on Wednesday is covering "Camp Perry National Matches." Maybe there will be something regarding these targets? If this decision is a fait accompli, then I'd like to see the targets positioned in clubs around the country and brought to Perry only for the Nationals. Spread the 150 targets to 10 or more ranges across the country. Target sharing is being done in Europe, the CMP has their mobile range with 30+ eTargets, so it can be done. Dennis is really looking like a "tool" on this one. Go ahead Dennis, you'll be famous as the guy that set the sun on Camp Perry. As slow as the nra is with everything else I doubt we shoot on a electronic target anytime soon. id say it will take them minimum of 5 years to implement the change. I just received an email from Denny that the NRA just implemented another round of budget cuts so the option for the electronic target program is off the table. Denny is still of the belief that electronic targets are the only way to save bullseye from extinction, so please email Denny directly about your ideas to help grow the sport without focusing on just the 1 event--the national pistol match. Denny also said he has only had feedback that agreed with his article--let him know what you believe. well typical nra, I always wondered if they wouldn't fund fixing the current system how they would be talked into coming up with the huge amount to go electronic. Answer is they wont, what will ruin bullseye at perry is if they do nothing now that their golden idea is shot down. We need Dennis to try and get the current system upgraded. DavidR wrote: well typical nra, I always wondered if they wouldn't fund fixing the current system how they would be talked into coming up with the huge amount to go electronic. Answer is they wont, what will ruin bullseye at perry is if they do nothing now that their golden idea is shot down. We need Dennis to try and get the current system upgraded. My concern too! Will there be money to fix the current system and will the budget cuts mean higher fees or a reduced venue. Is Talladega in our future?